There are a lot of mobile credit card readers on the market, and all of them help you take debit and credit card payments on the go. Why should you choose SmartTrade instead of one of the larger providers? Because SmartTrade is so much more than an iPhone credit card reader. It’s a one-stop shop for managing your quotes, bookings, jobs, and payments! When you’re running your own business, you don’t need something huge and flashy. 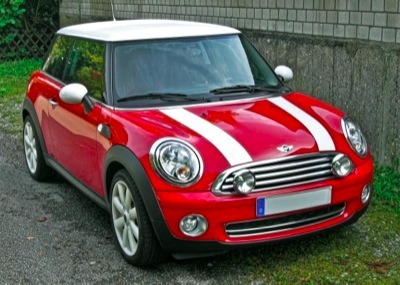 Skip the Ferrari and go for the Mini—it won’t blow the doors off of the competition at 200 kph, but it’ll keep going long after the others have run out of petrol. SmartTrade has all the sense and efficiency of the Mini, one of the most iconic cars in British motoring history. It has everything you need and nothing you don’t. SmartTrade lets you manage your jobs from your mobile, on the go, whenever you want. Send quotes via e-mail, let customers approve them from their inbox, and get notified when your quotes are approved. Watch our video to find out how easy it is to use SmartTrade to run a smarter business. Send customised statements and receipts with your own logo and T&Cs from the online dashboard. And take payments more easily than you thought possible: just zap a card with your mobile’s camera and the payment will start processing! And with the online dashboard, you can manage your customer list, send job leads directly to your phone, and even download tax information that can be directly integrated into Xero, SagePay, or QuickBooks accounting software. No other iPhone credit card reader offers this ease of taking payments or this many features that will help you run your business. You’ll be more efficient, more productive, and more profitable. You can get all of this with no hardware and no contracts. With most iPhone credit card readers, you need to buy a reader (which can be expensive), sign a contract (that locks you in), and have a merchant account at a bank (which is expensive and a hassle). All of this adds up and means that you end up paying more in the long run. With our mobile payment app, all you need to do is sign up, enter some information about your business, and you can start taking payments in a few minutes. Just zap the credit or debit card your customer wants to use with your mobile, and you’ll get your payment in seven days! What really separates us from other credit card readers is that SmartTrade isn’t a credit card reader at all—the SmartTrade mobile payment app is something totally new. It’s an all-in-one business management tool that helps you run a smarter business from the palm of your hand. And it’s free! You just pay 2.65% + 20p per transaction. And for only £19 per month, you’ll get all of the awesome benefits of our online dashboard. So what are you waiting for? Ditch your current credit card reader and give SmartTrade a try. What do you have to lose? Just your hardware, contract, and high transaction fees. Download it for free now!